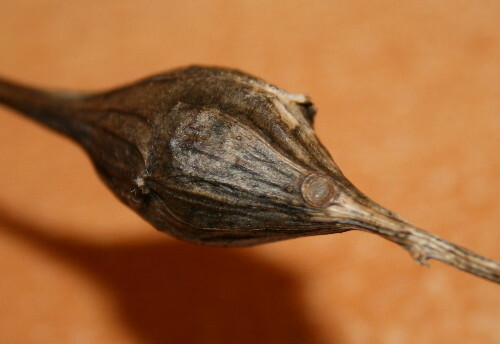 Here’s a topic that is frequently written about at this time of year: goldenrod galls. They’re common and they’re conspicuous, and they tend to grab people’s attention. Last winter I remember reading a few posts by various people on the galls. Most of the time the ones that are written about are the round ones that resemble a snake that has swallowed a ping pong ball. But there’s actually four different types of goldenrod galls, of which the ping-pong sort are just one. One affects the foliage at the growing tip of the plant, and the other two are also stem galls, but elliptical in shape, as if the ball the snake swallowed got deflated. It was while out walking Raven this afternoon that I came across a few of these. Strangely, no ping-pong galls, which were ubiquitous in the GTA (and perhaps here, too, just not along the road section I chose to walk). I picked up three and brought them home with me to check out. Ping-pong galls are often the target of chickadees and woodpeckers, which bore into the gall to get the tasty grub inside, but you don’t see that as much with the smaller galls. I saw no real evidence of predation, so I figured the gall’s contents were likely still intact, although it’s possible that the small hole, as in the photo above, was evidence that the adult had left. When I opened up the first one, there was an empty pupal case inside. This had obviously belonged to a moth, now departed. You can see the segments of the abdomen clearly defined in the case, as well as the wings, which wrapped around the front of the moth’s body. The ping-pong galls are the product of a fly larvae, but both elliptical galls host moth larvae, but different species. The moth in this one is the Goldenrod Elliptical-gall Moth, Gnorimoschema gallaesolidaginis. This moth lays its eggs on dead foliage around goldenrod, and in the spring the larva hatches and crawls up a goldenrod plant, where it bores into the growing tip and down a few inches through the centre of the stem, where settles down for the summer. 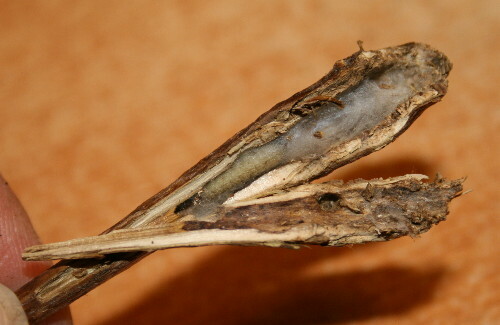 The plant, in response, forms a thick layer of stem tissue around the invader. The larva pupates in the late summer and then emerges from its home in the fall to mate and start the cycle over again. 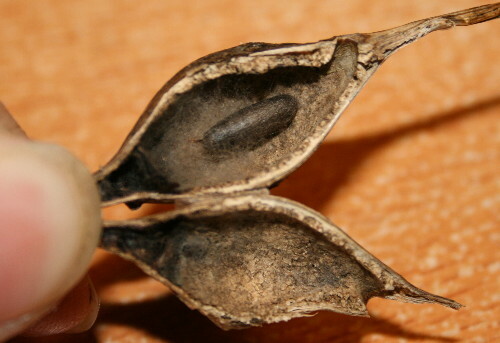 In order to make it easier for the adult to leave, the larva will bore a hole out to the outdoors and then plug it with a silk trapdoor that is shaped the same way you would carve the lid on a jack-o-lantern – beveled, with the inside smaller, so that the lid can’t fall inside. This makes it easy for the moth to leave when it’s time, but hard for a predator to get inside. You can see the round plug in this gall, and also the one in the second photo. You can also notice in the photo with the pupal case that it is attached to a mat of silk at one end. The silk actually blocks the entrance that the larva came in by, which helps the adult to find the plugged exit hole and not go out the wrong way. I was a bit surprised to discover the second elliptical gall had a larva in it, not an empty pupal case. Poking around the ‘net a bit, it turns out there are two species that create elliptical galls. The second one is the Goldenrod Gall Moth, Epiblema scudderiana. This species is different in that it overwinters as a larva and pupates in the spring, emerging as an adult in May and June. 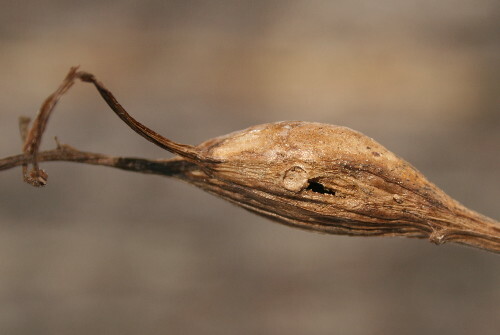 The galls are hard to tell apart from those of the Elliptical-gall Moth, the main feature being that they lack the exit plugs that the other species makes. They can both occur in the same patches of goldenrod, and sometimes even on the same goldenrod stem. 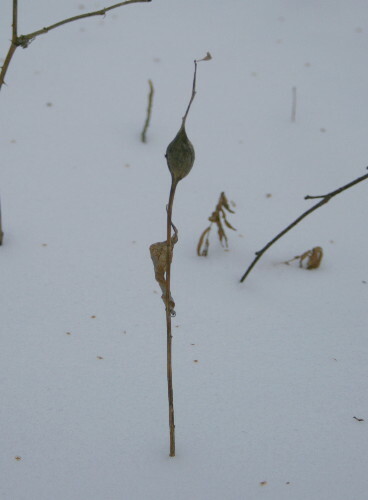 Next time you see a goldenrod stem with two elliptical galls you can check to see if they’re different species. The third gall held neither a pupa nor a larva. Instead, it appeared to hold the cocoon of another species, perhaps a type of wasp larva that had usurped the chamber and fed on the moth larva. There are four species that will parasitize the moth larva, but it may be Calliephialtes notandus, which targets the Goldenrod Elliptical-gall Moth and other stem-living moth larva. 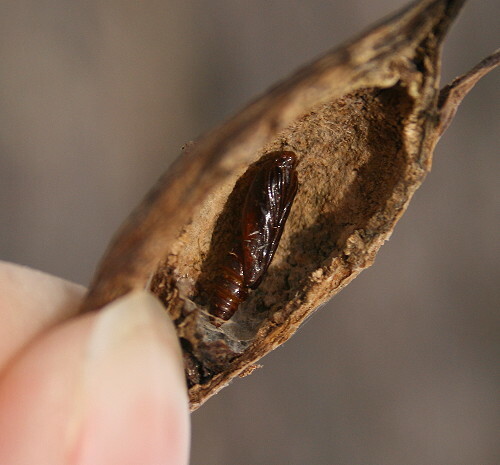 The wasp larva eats the moth larva from the outside (as opposed to some wasp larvae where the egg is laid on or in the host and the larva eats the host from the inside out), and eventually pupates in a tough, light brown cocoon shaped like a fat grain of rice. The adults emerge in September, so this winter case, like the moth one above, is also empty. You can see the tunnel at the top of the gall (on the right) where the adult would probably have emerged from. I would have thought the elliptical ones were just sloppy architecture from the same little fly grub. The truth is much more interesting! Funny how I learn more from your blog than from the years spent in university. Easy-to-digest information + great pictures = enjoyable learning. Thanks!